Disclaimer: These views are my own, and come from my 20-month experience as a Suzuki parent in a SECE class, as well as a couple of days’ observing SECE training this summer, and a few weeks under my belt as a Suzuki teaching partner. 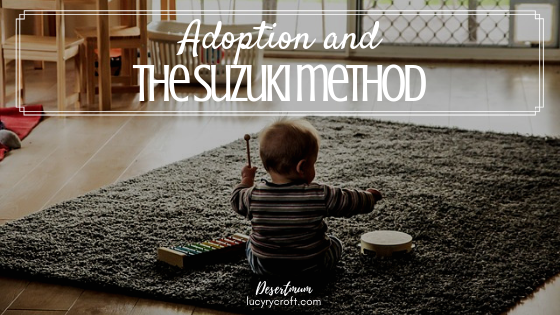 In short, this post represents my understanding of the Suzuki method, and the effect it’s having on our family – it doesn’t necessarily represent the views of any trained Suzuki teacher. Thank you for reading! Learning the Suzuki way has had a massive impact on Monkey and Meerkat’s musicality. They’ve just turned three and can sing in tune, clap/beat in time, and read simple rhythmic notation. They can pause, wait and anticipate when a particular sound or action is required in a song. They can respond to music with an awareness of different timbres and textures that many of my Year 7s used to struggle with. Their musical achievements have surpassed those of Mister and Missy (who weren’t Suzuki-educated) at a similar age. Dr Shinichi Suzuki (1898-1998) developed his philosophy following the Second World War. Appalled by the awful acts he’d heard of, saddened that the human race could perform such despicable acts against one another, he believed that, through education, humans could become better people, and work to build a better world. And he felt that music, with its emphasis on encouraging empathy and mutual respect, could play a big role, saying “Music exists for the purpose of growing an admirable heart”. So it’s no surprise to discover that, for my boys, the Suzuki method is helping them to develop their whole character. This is not to ignore the genes that will obviously have an impact upon an adopted child’s life, but it is to say that the ‘nurture’ (good or bad) that has occurred since birth will significantly shape that child’s future. The genes do not need to be the end of the story. Suzuki believed that there is no such thing as ‘genius’, that we all possess immense ‘ability’, and it is the nurturing of this ability which determines our futures. This, of course, is an incredibly affirmative philosophy for any adoptive parent, as they’re aiming to give their children great opportunities throughout life and encouraging them to raise their aspirations. I don’t know how my boys’ lives will pan out, but I do know that they’re already surpassing my expectations of them musically, so why not socially/emotionally/academically? Adoptive parents know this only too well, having heard and seen many examples of a poor environment on a young and formative child. They never give up hope that the environment they are providing for their children will encourage them to grow and develop into all they were meant to be. The environment of the Suzuki classes themselves is calm, respectful, joyful and encouraging, and this challenges me to reproduce this through the week as I play or eat with my boys, get them dressed or clean their teeth. Before you start to imagine the calm, dream-like environment of the Desert household, let me tell you that I am, by nature, incredibly impatient, snappy and irritable when my children cross me. We are by no means a calm household! But, with the encouragement of the Suzuki philosophy, we are trying! A parent is the most important model a child has. Think about it: when an old friend comes to the door – someone you know but your child doesn’t – and you greet them warmly, doesn’t your child warm to them too? When the friend is invited in, won’t your child be happy to play with them and get to know them, because they’ve seen you model that this person is ‘safe’ and ‘OK’? On the contrary, when a cold-caller comes to the door, and your manner is stiff and abrupt (well, mine is), doesn’t that also breed anxiety in your child, who’s watching you all the time, looking for signals from you as to how they should respond? But in a Suzuki class, parents are encouraged to play a full part in all the activities – singing, clapping, playing, dancing, moving – both to model how these things are done to a child who is not yet ready to do them for himself, and to communicate to their child, “This is of value – this is important – I rate this enough to be doing it myself”. 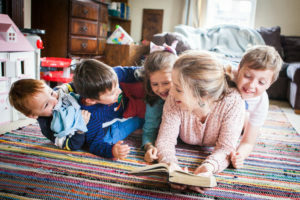 Of course all parents need to consider what they are modelling to their children – but for adoptive parents in particular, who are aware that some of the behaviours and thought-patterns presenting in their children are very deeply engrained, the need to be a strong, positive and consistent role model in their children’s lives is an urgent one. The Suzuki approach has definitely affirmed my role in the lives of my boys – otherwise I may have started to feel quite helpless when confronted by some of their more challenging behaviours. There is a 2-month-old boy who attends one of the Suzuki classes I have the privilege of assisting with. He can’t sit up, let alone sing or clap or dance; a non-Suzuki observer might think it ridiculous that he be there at all. But every week he is becoming more awake and alert. Every week he is starting to respond to the music – either by turning his head towards the sound, fixing his eyes on the instrument being played, or watching the older children play and dance. This might be overlooked by a non-Suzuki educator, but a Suzuki educator would know better. A Suzuki educator would know that, as we develop our language by being surrounded by it, so we develop musical ability by being immersed in it. I can’t wait to see what this little boy is doing in a year’s time! Has anything about the Suzuki method jarred with my adoption training? Well, aside from the back ache resulting from carrying two non-walking twins around in a circle for numerous songs in the early days when I couldn’t allow others to pick them up, not much. There is, however, an interesting idea within the Suzuki philosophy that we are not to ‘over-praise’ our children, the basis for this being that children ultimately need to be motivated by their own sense of pride/success, rather than doing things purely for others to pat them on the back. Over-praising a child, according to the Suzuki philosophy, can lead them to become demotivated. While I agree with this from an educational perspective, when our boys arrived with us – and even now – I hugged and kissed them a lot, and used verbal encouragement/motivation as much as I could, partly to make up for lost time (the 14 months before they came home to us), and partly to build attachment, to reassure the boys that they were home and they were ours. To start with, holding back on this during Suzuki classes felt unnatural. But of course this has to be balanced with ‘encouraging the small steps’ so, 20 months in, I feel we’ve now found a good balance, and I praise my boys when they need that encouragement, and hold back when they need to feel that surge of pride coming from within themselves. And the whole Suzuki approach is teaching me to know the difference.